Secrets, poverty, a kind guardian and an unkind one, smallpox, disfigurement, an illegitimate child, a court case that drags on for years, love, death, a half-mad woman, spontaneous human combustion, a prodigal son, renunciation, comedy, tragedy, strange characters with stranger names, (Guppy, Snagsby, Jellyby) loyalty, suspicion, drama, murder. Bleak House by Charles Dickens has it all. Bleak House is considered one of Dickens' best works and the reason is clear. He takes a vast array of characters, plots and sub-plots and weaves them into a cohesive whole, in the process creating a book that is hard to put down. The novel revolves around a court case, Jarndyce and Jarndyce, that has been dragging on for years. The story is told from two viewpoints, that of an omniscient narrator and that of Esther Summerson, the heroine. Esther is raised by a stern and rigid woman who tells her that she is her mother's shame. Eventually, she is sent to school and after that John Jarndyce becomes her guardian. She goes to live with him at Bleak House along with Ada Clare and Richard Carstone, cousins who are connected to the court case. Ada and Richard fall in love but their lives are blighted by the court case. Richard is unable to live his own life, instead solely focusing on the case and what it might mean for them. He is a weak man, it is true, but never a despicable man. Esther, like many of Dickens' female characters, is a bit too good to be true. She is constantly amazed that people love her, always minimizing her own value and importance, and yet somehow I ended up liking her. Much of the novel has to do with the secret of her birth, which is not really a secret to the reader, and how the ramifications of that secret cause hurt and chaos. Honestly, I have been sitting in front of my computer screen for ten minutes trying to figure out how you write a synopsis of a 900-page novel that has enough characters and plots for ten novels. I don't think I have the time, energy, or stamina to do it and I am sure that I would lose my place in the plot. Somehow Dickens never did. I was amazed by how the two narrators wove around each other and how the many, many storylines eventually all connected. I did occasionally find the switching between narrators a bit jarring, almost like I was reading two different books, but I eventually got used to it. Dickens is a sentimental writer, it is true, and that is so with this novel as well. He likes to squeeze the last possible tear out of his audience. However, he does it with a purpose. I didn't feel he was killing off characters purely for effect. Many of the tragedies point a finger at problems in the social framework of the world he lived in. The poverty was horrifying and he made that clear. The court case that surrounds the novel points up huge problems with the justice system of the day. Dickens' novels paint a picture of a world that is a mix of humor, sentiment, grotesque characters, and angelic ones. With any other author, you would end up feeling that his brush strokes are too broad but somehow he makes it work. The BBC produces an adaptation of Bleak House in 2005. I will definitely be watching it. I've seen the BBC adaptation of Bleak House and absolutely loved it (definitely worth a watch), which is what prompted me to add it to my Classics Club list. I think I would struggle with the dual narrative too until I get into it, but I'm looking forward to it. It is nice to know you recommend the BBC adaptation. I might have to read some more Dickens. I do like big dramatic books you can sink into. I see from your blog that you really like Wilkie Collins. He fits that description too. I have a lot of his books I still haven't read. Writing a review of Dickens can be very difficult because there's so much to say, but how do you give it justice? This is one of Dickens' books that I have been wanting to read for a long time. I had a project to read all of his novels a while back and have slowed down quite a bit. Don't think I've read one in over a year. I've been planning on this one being the next. Thanks for the reminder. I struggled with the review because there is just so much going on in a Dickens novel. I finally went more with impressions instead of a synopsis. I hope you enjoy Bleak House. I know I did. I loved your thoughts on "Bleak House!" 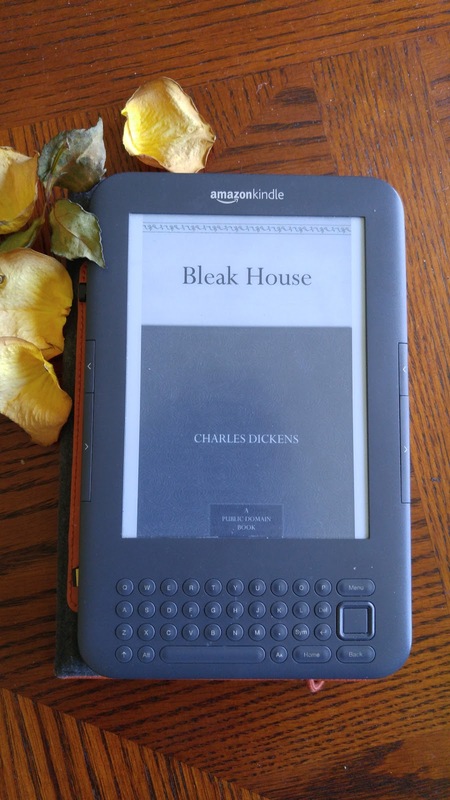 Maybe Bleak House isn't the Dickens novel for you. Have you tried any of his other novels? Maybe Dickens is just not the author for you then. We can't all enjoy the same novels. He is very detailed and many words and ways of life have changed. That must make it much harder if English is not your first language.